Few flew the Hurricane better in combat than Squadron Leader John Grandy, Commanding Officer of 249 Squadron. 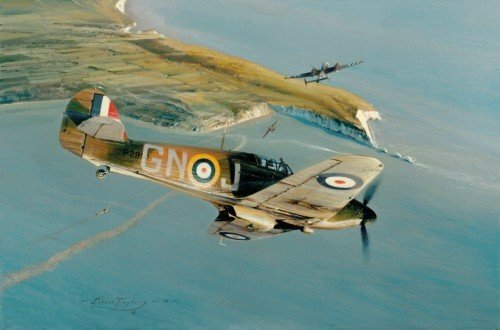 Robert’s iconic painting Hurricane Attack portrays him about to pounce on a Bf110 over the Isle of Wight in August 1940. Originally published as a companion with Height of the Battle RAF limited edition print, this superb piece is now released as an individual Giclée Studio Proof. Available individually, as matching-numbered pairs, or as a full set, with HEIGHT OF THE BATTLE and MAPLE LEAF SCRAMBLE whilst stocks allow.